As the majority of plastics processing machines are running almost continuously, they are susceptible to accumulating degraded materials consisting of oxidised polymer, black carbon deposits, and other matter derived from coloured pigments and additives that have been processed. For efficient and defect free manufacturing it is essential to maintain the cleanliness of extrusion and moulding machinery. The use of purge compounds and shutdown materials will greatly help to achieve this. Wells Plastics have designed purge and shutdown compounds that when used in conjunction with each other, and coupled with good general house keeping practices, will keep processing equipment in prime condition. Wells Plastics purge compounds contain a synergistic combination of chemical and abrasive cleaning agents to remove degraded materials and other foreign contamination from the extruder. It is advisable to have a regular scheduled purge programme to keep degraded materials to a minimum. Wells Plastics purge compounds can be used to clean between colour changes to reduce downtime, and lessen the risk of colour cross contamination. A purge of the machine will also be beneficial prior to any planned shutdown of the extruder. 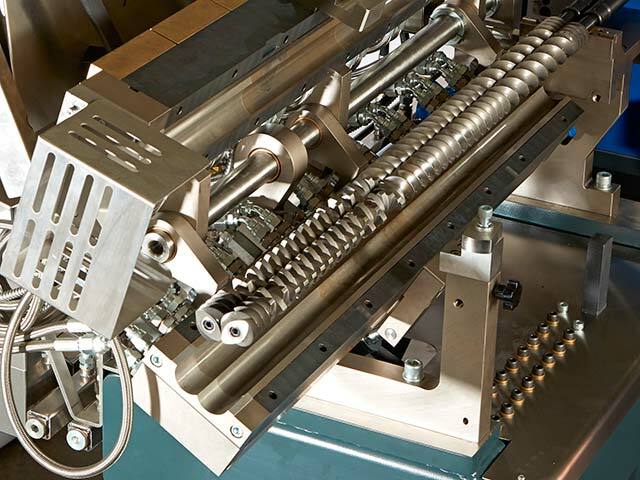 Wells Plastics shutdown compounds contain highly efficient thermal stabilisation packages that prevent the polymer from oxidative degradation during long periods in the extruder barrel. The shutdown compound protects the material in the barrel from degradation during the cooling down and heating up processes, thereby giving faster start ups and greatly reduced start up scrap. Once introduced to the extruder, Wells Plastics shutdown compounds will be sufficiently stabilised to sit for several hours at reduced temperatures (around 100OC). This is often important as it can allow maintenance to be conducted on ancillary equipment with the confidence of a rapid, clean start up. It is also good practice to use shutdown compounds during ‘planned shutdowns’ such as weekends and holidays, where they will facilitate much faster start-ups and return to ‘good’ production. Wells Plastics shutdown compounds are well stabilised to cover machinery shutdowns to ambient temperatures for periods of several weeks.